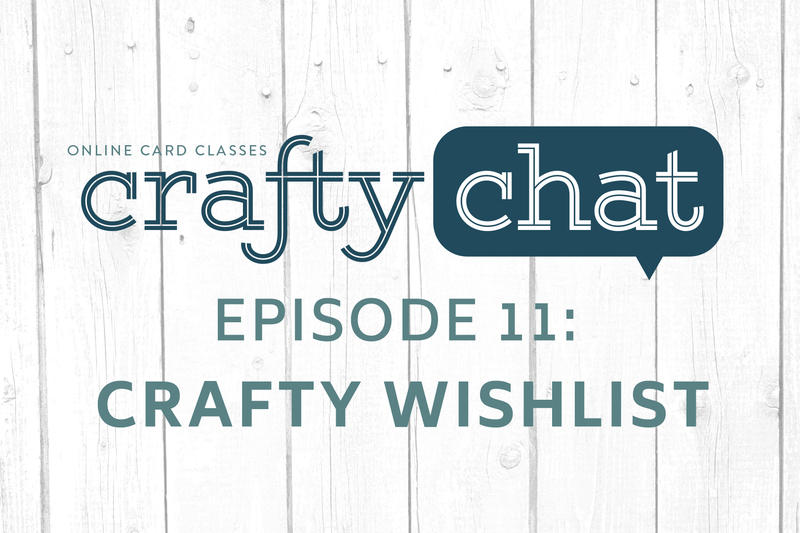 In today’s episode, we are revealing our crafty (and non-crafty) wishlists with our friend and Online Card Classes instructor – Laura Bassen. I just found out about “Crafty Chat” and this was the first time I have watched. I so enjoyed this chat and was “googling” as it went along. Much was learned – thank you ladies. Being Canadian I buy a lot from the US – I have never paid duty costs for craft stuff – it is duty free. What is not duty free is fine art materials. But, what kills me is the exchange on the US Dollar. $25.00 US is $34.00 Canadian and when you are on a pension that is a big hit! Thanks for the fun chat and all the info. OMGosh I must have been under a rock, I just found Crafty Chat!!!!! Loved it now to find past episodes!! Loving Crafty Chat!! Lydia – the Duralar that makes your wood mount stamps into cling stamps to be useable in the MISTI…is this the one listed in the notes? Thank you!! Looking forward to more chats! I really enjoyed the chat. Thanks! You talked about inks. I have fallen in love with Lawn Fawn inks and use Kristina Werner’s way to label my ink pads. It works wonderful! I do love Gina K ink pads and own a few, labeled Kristina’s way also. I guess I am able to build my Lawn Fawn ink collection quicker than Gina K inks, due to being able to purchase with a sale. They seem to be very similar inks and some are pretty exact. I owned Gina’s Kraft ink, then purchase Lawn Fawn Doe ink. They are pretty much the same. I am noticing many of the colors are very close or the same. I sure wish companies would use the same names and it would make figuring out if one ink matched another vendor’s inks. Hi Kristina…. I believe the mini Ruby stamp is only available with the storage case. I don’t think you can purchase as an individual stamp unfortunately. It’s very funny — Lawn Fawn makes an ink called “Manatee,” but they don’t have a manatee stamp. My wish is that stamp companies would have fewer stamps in a set with matching dies so we could afford to buy both stamps and dies. I would love to have dies for more of my stamp sets, but that isn’t possible for me. I’m with Jennifer on having a six-month moratorium on new releases too! I love online card classes and the crafty chats. I have learned so much and am looking forward to the embossing class! Xylene is the only thing that will remove ink from a gold leaf pen. Great info – thank you! Hi Lydia you mentionned a stamp compagny that has sentiment stamps can you remind me which one it is. Who needs colored vellum? Not me, since I learned how to color it myself from on line card classes! Turned out gorgeous and I can make any color I want! Brilliant! Love these crafty chats – you guys rock! i just learned about these chats & just watched the wishlist episode- so fun! can’t wait to watch more! Hey Kristina Ruby is the stamp included with the mini storage case on SSS. Mini ruby was a limited release. at SMS.com you had to buy the zippered case to hold all the minis and it was included try them! I just discovered you and this is the first video I watched. You made me laugh and I learned some things as well. I have a friend that does collie rescue and has several Smoothie collies and has not been able to find a smoothie stamp. My daughter is an opera singer and I wish, oh I wish a company would come out with many famous opera characters. I would like traditional and whimsical both. Kristina – Have you been able to find the Gorjuss stamp? Mini Ruby is only available if you purchase the storage case. She comes with the case. I just got the case and her to complete my Gorjuss mini collection. I got it Blitsy! Have any of you tried the Mr. Clean Eraser for cleaning off solvent inks? I used it on my acrylic blocks and it took Staz-On ink off, no problem! You can find some colored vellum at ecstasycrafts.com. They are having a garage sale right now. Wonder if they are discontinuing their colored vellum. Supply is hit and miss but the prices are good. Keep up these wonderful chats. Would love to see an episode telling what your favorite products are. I live you gals. I wish my job was like yours but I’m not near as creative as you ladies. However I am great at planning events so maybe I can plan your DIY/Crafting event for bloggers. :). Seriously love watching these crafty chats as well as your individual videos. You ladies make me believe I can do creative card making & Stamping & you help make it fun. Thank you!! Loved the chat. I feel like I might rewatch it when I want a pick me up on a hard day. A side comment: the link to the ‘Quiet Packing Tape’ actually brings you to the storage bags sold at SSS. Have you ever tried a product called “un-du””? It is so amazing! You can lift off stickers and still use them,you can,for example,lift a crooked card panel off and reposition it. A great product,it’s not oily in any way,and won’t destroy what you are lifting. Lots of uses. I also use it for medication patches that I wear on my skin and leaves a sticky mess on my skin. I would like to see a Crafty Chat about Jennifer, Kristina & Lydia and other card making artists on how they began in the industry making this their full time job. Did it begin with their blog and then they were approached by a stamp company and asked to do videos? I know I would like to have this as my job and I would like advice from the experts on their secret to success. Like the old saying ” find something you love doing and then find a way to make money doing it.” Thanks! Plain peanut butter, left on a sticky spot for about 24 hours, will take it right off. Learned this from a neighbor when I was a newlywed 36 years ago, lamenting the stickers on our wedding crystal. Just discovered Crafty Chat and I’m binge-watching like some do Game of Thrones!